The new year is approaching quickly, and we all want to get healthier. So why not resolve to live a healthier life with your dog? They can help motivate you. I mean you’ve already made the commitment to have a dog in your life, right? And you and your dog want to be in the best shape of your life for 2019 and many years after that, right? Why not commit to extend the length of your life with your dog by your side? Now let’s all just simply make a promise to our dogs to head out the door together this year. But wait! There’s so much more than just heading out the door and hitting the pavement. I’d like to advert your attention to a past article written here on 4Knines.com by a fellow dog trainer, Jayde Davey, where she speaks of reactive dogs. On any walk or run any dog can become reactive. You need to know how to handle such a dog and/or situation as they arise to ensure the safety of all. Knowing how to run or walk with your dog without them pulling you all over the place or darting out into traffic after a squirrel is imperative. The first month of 2019 can be simply heading out the door and practicing your short run down your road! Oh, did I mention having proper footwear, paw protection, leashes and collars/ harnesses? We must dress for the elements that we will be exposed to, and we must protect our feet and paws as they will be carrying us the whole way through. Colder weather can wreak havoc on our dogs’ paws, as can hotter weather. Having proper footwear will ensure less injury for you both. If you do head out and it’s raining, make sure your vehicle is protected from the muddy or wet paws with the 4knines seat covering - tried and tested by actual dog owners. If you head over to the beach and your dog heads into the water, your car seats will be protected. Have a plan for how you train with your dog. Not everyone will be training for a marathon, half marathon, or even a 5k, but with every step you take, you’ll still need a training plan in place. Look at where you are now and take your first time out to really get to know how you and your dog do and what you would like to accomplish in the future, and then go from there. Increase your time out and about slowly, maybe increments of 5 or 10 minutes- whatever you think and feel you can BOTH handle day by day. Or, alternatively, you can increase your distance. Maybe the first few days you’ll head out around the corner- say it’s a mile, then over the next week or two you increase to two miles. Do what you AND your dog can do without injury. Build up slowly but surely! One way to prevent injury is to stretch after running or walking around. Trust me, your dog is already doing this. Watch them - I’ll bet you anything you can find them stretching throughout the day! Now watch them and duplicate their stretches for some awesome stretches to prevent any injuries in yourself. PROTIP: Always stretch after warming your body up - you never want to stretch cold muscles- and you will be building muscle as you get out there with your dog(s). Having trouble coming up with a training plan? 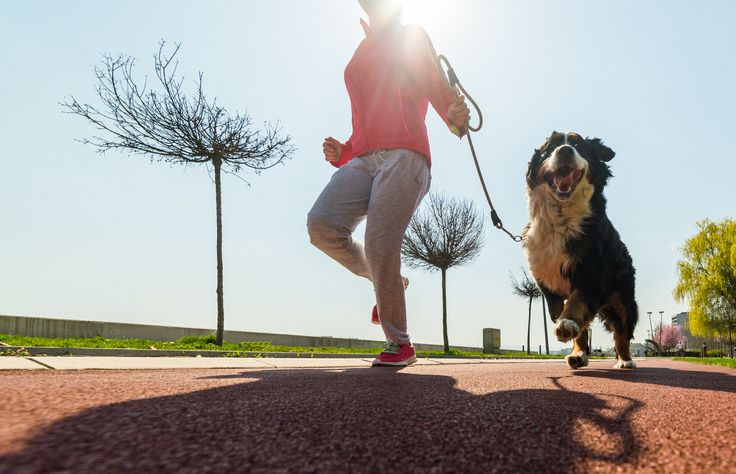 Maybe you want to train with your dog for your first 5k together? Don’t worry, there are courses you can sign up for online to learn how to train and stretch properly together! Let’s make 2019 the year of YOU and YOUR DOG! While there is much to consider before heading out together, the most important thing to remember is to HAVE FUN with your dog. Keep running safe and fun, and don’t be afraid to talk to your dog (people actually think I’m more sane for talking to my dog than ignoring them!). 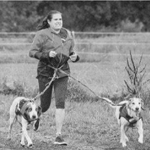 I am a dog trainer and health coach for teams of people and their dogs. I am the author of “Get Your Leash On!” which is a guide to living a happy and healthy lifestyle with your dog. Knowing how to train with your dog to do basic dog training behaviors, and how to SAFELY train with your dog to get moving is important to a longer and happier life together, combining that with healthier ways of eating as a team. Cooking once for your dog and yourself instead of making two meals is less time consuming and more fun! I share my life with four dogs, I call them my 4 American dogs. Scout and Liberty are my two American Foxhound “mixes” (although if you ever heard their bay/ howl you’d drop the “mix” as well). They came to me via way of the Smithtown Hunting Club (who uses American Foxhounds in their events) and Kent Animal Shelter. Then there is Freedom- my Shepherd Mix who thinks she is Scout’s mini me- and then finally Justice, who is my GSD. We typically run anywhere from 3- 6 miles a day together. I one day hope to become the internet’s go-to dog-and-human-team health coach so I can help teams live together longer, changing the world around us to be that much better. Can we elect a dog in office one day? LOL!